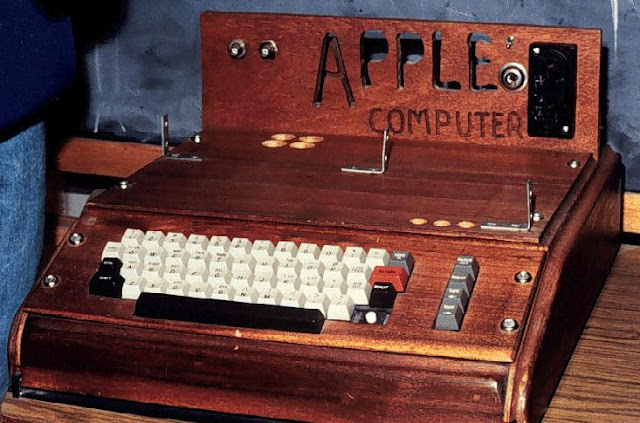 One of the very first Apple computers hand-built by Steve Jobs and Steve Wozniak in a garage almost 40 years ago is set to fetch up to 330,000 pounds when it goes under the hammer here. The Apple-1 Computer motherboard was in the first batch of computers for Apple's first client, the Byte Shop, originally costing just 437 pounds. The computer, which is fully functional and one of the best preserved version ever seen, will go under the hammer in Bonhams on September 21 with a conservative estimate of 330,000 pounds. Designed and assembled by Jobs and Wozniak in a garage, the 1976 motherboard was traded in at a computer shop in Florida having rarely been used. The pre-assembled computer is just a motherboard that required the owner to provide a screen, keyboard and casing. "This is from the first batch of 50 because they received an order from the Byte Shop who put inventory numbers on them with a security pen, Only 66 surviving authentic Apple-1's are currently listed on the official Apple 1 registry. Can We Draw the Limit on Data Collection?